I think that I've already told you that I love plates. Even if I haven't, you should probably have guessed it anyway. I'm just a plate kind of girl. If I had a mission statement, part of it would include my belief that one can never have too many plates. This actually applies to any type of china/porcelain/transferware and on to my other collections. But those are different posts and I don't want to sound too greedy here. Anyhow, Susan over at Between Naps on the Porch is having her weekly Metamorphosis Monday, where her readers share their "Before and After" stories. I'm also linking up to Savvy Southern Style for Wow Us Wednesdays. When I was trying to think of what I could write about, the recent transformation of my dining room came to mind. It's a bittersweet story and involves my obsession with use of plates as wall decoration. Grab a cuppa as I share my tale of woe with you. (Don't worry, though, because it has a happy ending….sorta). Along with plates and many other things, I love bright colors. Not only the primary kind, but also the shrimp pinks and the turquoises, the chartreuses and the mangos, the cerulean blues and the shocking fuschias. I love to browse through the OPI nail polish colors. I seriously love the combination of these colors. I could decorate a beach or lake house in no time flat using the colors of OPI. Unfortunately I must curb my enthusiasm for using bright colors in my own house. It's not a huge place by any means, and if I used a different color in every room, it would look like the circus came to town. I've pretty much gone with a neutral background with pops of color here and there. Some blue and white in the kitchen, green majolica in the den, a pinky green floral rug in the guest room, an Oriental rug here and a zebra rug there. Things are fairly calm and soothing….until we reach the dining room. That's where things get a little more interesting. I've had a red dining room in my last three houses. Because the room isn't used often, I felt that I could afford to be a little edgy and think outside of the neutral box. And I could showcase my plates…..lots of them. So here goes with the "before" part of this post. Hold onto your socks because it's a tad startling, and not in a good way. That's a painting of my great grandfather. I started collecting Imari porcelain about ten years ago; this was before my collection got so out of hand large. The lamps have mirrored bases with cream shantung shades. The small chandelier was in the dining room of the house in which I grew up. Pardon the quality of these first pictures; I took them with my old phone. As you can see, my Imari collection has grown. There are twenty plates hanging on the wall. That doesn't include the vases on the brackets and everything on the sideboard. Lots of stuff. I thought it looked great, but then people started making little snippy comments. One of my friends told me that I had a "plate affliction." A decorator friend told me tactfully that while she liked my plates, she didn't think I needed to add any more. Slowly I started having feelings of doubt about my wall of plates. And just like that, everything changed! 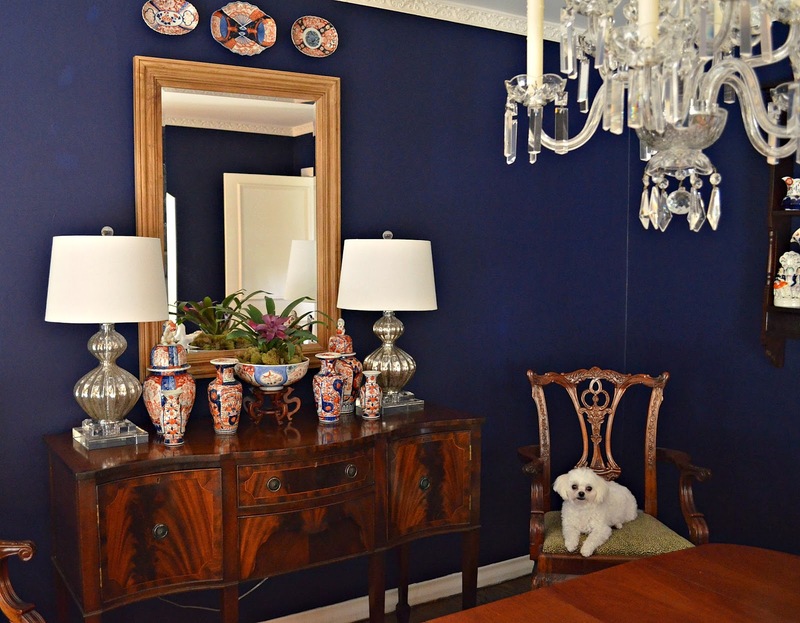 New paint color: Benjamin Moore's Bold Blue, #2064-10. New mirror, lamps and chandelier. Same dog. Down from twenty plates to only three! Overall, I have to say that I'm pretty happy with the transformation. I decided to go with navy blue walls because I felt like it added a little Ralph vibe. My aunt painted her dining room this color back in the 1960s before anyone had ever even heard of Ralph Lauren, and I always liked it. I like the way the blue walls make the colors of the Imari porcelains pop, and I think that the mirror really helps to open up the room... But I do miss my warm red walls, my totally ridiculous number of plates, and even my old Great Grandpa. But I'm not worried because I have just the perfect spot for him at my husband's office, along with a plate or two. I know he'll be thrilled. GORGEOUS...WOW! Your Imari collection is fabulous and displayed against that rich navy wall is really amazing looking. Thanks for sharing! Thanks, Tina! I think that a few needlepoint pillows from our new online store would make the perfect finishing touches to my dining room re-do. Glad you stopped by. Yes, I'm thinking I'll put a few of the plates back up. I just won't let my decorating friends see them! Laurie - I feel the same way about yours. Thanks for visiting! Just lovely. I am your newest follower and we have a lot in common. Lots of plates and a former red dining room (well, my morning room which used to be a dining room) which is now Laura Ashley Navy. :) I will post pics soon, come check it out. I love the transformation. Stunning. Barb - I will definitely check out your new morning room. It's always fun to see a gorgeous transformation, and I'm sure that's what yours is! Love love LOVE The new navy walls! and your placement of objects is just stunning! Ralph, and you know how the look too. Thanks for the sweet comments, Alison. I'm looking forward to your next linky party on April 1. I'm having trouble deciding on my favorite tartan. So many choices!